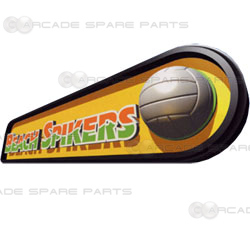 Beach Spikers (Virtua Beach Volleyball) rides on the crest of the wave of popularity for sports games. 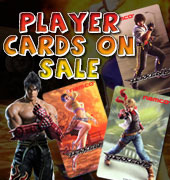 Players can experience the heat and sunshine of the summer, clear blue sky, pure white sand and gorgeous bikini clad babes all from their local arcade. A combination of intuitive pick up and control joystick and 2-button operation makes gameplay simple but fast and intense. Learn to serve, receive, block, set-up, feint and spike the ball all with a touch of the button. Use the power gauge to adjust the strength of each movement. Rapid camera view changes and angles give an exciting dynamic TV like action suspense. There is a choice of 8 different teams - Italy, Spain, France, Japan, Cuba, Australia, Brazil and USA each with their own unique style of play to choose from. Use the intricacies of each teams attributes to outsmart your opponent. There is also a choice of 4 different stadiums and stages to play - Mikasa and Sega (Daytime), Swatch (Evening) and Coca-Cola (Night). 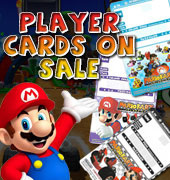 Play the game in either Single Play, Match Play or Tag Team Play.